A Nintendo Switch running a version of the SNES Classic home menu. Nintendo might not have plans to bring Virtual Console to Switch, but that doesn’t mean somebody else won’t. In light of new details about how Nintendo Switch Online will work and the company’s plans to bring NES games to the handheld via a subscription service, at least one hacker and longtime Nintendo fan is trying to take matters into his own hands. There are a number of ways one could theoretically go about putting old Nintendo console emulators on the Switch, and no doubt in the coming months and years all of them will be attempted by hackers with varying degrees of success. 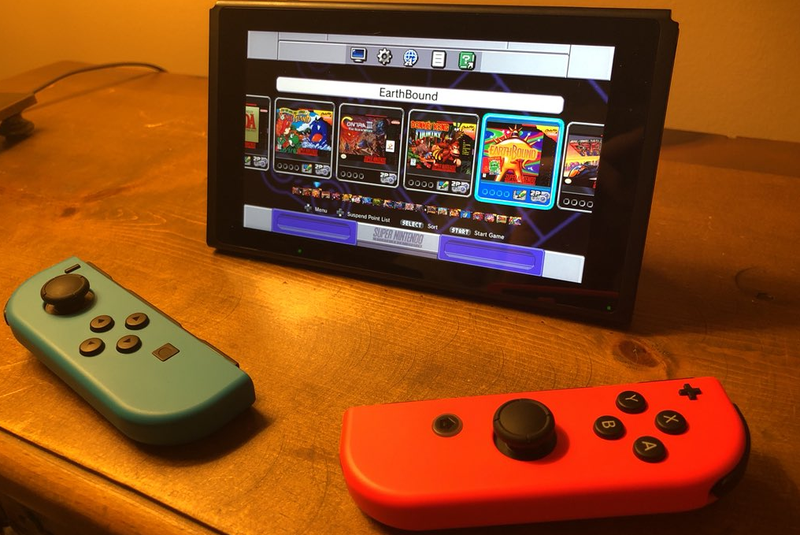 Sam Breadman, who tweeted out his current homebrew project over the weekend, will settle for getting an SNES Classic-style Virtual Console up and running on his Switch. While the individual games aren’t fully function at this point, the UI is intact and running on the console, and Breadman says he hopes to have the full suite of games, including save states and suspend points, up and running by late June. The way it works is by using the PegaSwitch workaround documented by ReSwitched, an established Switch hacking community, last fall. on a Switch that hasn’t been updated past firmware 3.0.0. PegaSwitch is a toolkit that allows people to run code on a Switch by connecting to it over Wi-Fi via a PC using a shared IP address. It’s an exploit that doesn’t jailbreak the Switch or itself allow homebrew, but it does help open up non-updated versions of the console to projects like Breadman’s, which introduces a makeshift Virtual Console installed on an SD card. It’s worth pointing out that while Nintendo has said it doesn’t have plans to put the sort of Virtual Console users of the Wii, Wii U, and 3DS have come to expect on Switch, it will be rolling out a 20 NES game library, including stuff like The Legend of Zelda and Super Mario Bros. 3, through its $4 a month online subscription service. But for Breadman, the individual wrinkles of this new program, combined with the lack of a unified eShop across Nintendo’s previous consoles, have driven him to embark on his first big homebrew project. “People don’t want to be tied to online subscriptions just to have their favorite classic game with them on this wondrous device,” he said. “There is still a ton of uncertainty in the air and I just want something I know I have control over.” Breadman, currently studying software engineering at college, says he owns just about every Nintendo console that ever made it stateside and found himself purchasing a digital copy of Super Mario Bros. every time it was available on a new device. Having to pay over and over again is also a large part of what’s driven him to this point, he says. While the current version of his hack just aims at letting Switch owners access the SNES Classic library, the end goal is to have a version that people can add their own ROMs and box art too. Hackers added similar functionality to the SNES Classic device itself only a couple weeks after it launched last September. “[My SNES Classic Clone] will evolve,” he said. “And as the switch homebrew scene matures, so will my program.” While Breadman’s hack only works for Switches with old firmware, others, like the recently publicized Nvidia chip exploit, could potentially star a new wave jailbroken and modified devices.